"EL ASOMBRO ES EL COMIENZO DEL SABER"
​(JIMENA DE LA FRONTERA, CÁDIZ ) EL AGENTE 9317 HA INICIADO ESTE PROYECTO. PRIMER TRABAJO DE INVESTIGACIÓN EN CRIMINOLOGÍA, ESPECTÁCULOS Y TALLERES DIDÁCTICOS DE ILUSIONISMO PARA PREVENIR DETERMINADOS TIPOS DE DELITOS. ​UNA DE NUESTRAS FINALIDADES ES DIVULGAR LOS BENEFICIOS QUE TIENE EL ILUSIONISMO EN CRIMINOLOGÍA. EL PROYECTO PREESCOLAR PERRY CONCLUYE CIENTIFICAMENTE QUE FACILITANDO EL DESARROLLO DE LOS FACTORES DINÁMICOS ( AUTOESTIMA, CONFIANZA, CREATIVIDAD, HABILIDADES SOCIALES. . . ) PODEMOS PREVENIR LA DELINCUENCIA. "FELICITACIONES POR EL ANÁLISIS Y MUCHOS ÁNIMOS PARA SEGUIR CON ELLOS"
Ejemplo de informe Beneficios Ilusionismo en Criminologia. ​FIRSTLY THIS INVESTIGATIVE PROJECT IN CRIMINOLOGY, SHOWS AND DIDACTIC WORKSHOPS USING ILUSIONISM TO PREVENT DELINQUENCY BEHAVIOUR WAS STARTED FOR AGENT 9317 POLICE LOCAL (JIMENA DE LA FRONTERA, CÁDIZ ). ONE OF OUR MAIN AIMS IS TO DIVULGE THE BENEFITS THAT ILUSIONISM HAS IN CRIMINOLOGY. THE PRESCHOOL PROJECT CARIBE OUT, SCIENTIFICALLY CONCLUDES, THAT IF CERTAIN DINAMIC FACTORS SUCH AS SELF-ESTEEM, SELF-CONFIDENCE, CREATIVITY AND SOCIAL SKILLS ARE FACILITED AND WORKED ON, IT DOES ENABLE US TO PREVENT DELINQUENCY. "SUPERBLY CARRIED OUT RESEARCH. SENDING YOU LOTS OF POSITIVE ENERGY TO CONTINUE AHEAD"
PRIMER PROGRAMA DE ILUSIONISMO APLICADO A CENTROS DE MENORES. ​​ENHORABUENA A TODOS LOS QUE HAN HECHO POSIBLE EL CONGRESO MUNDIAL DE MAGIA EN KOREA 2018. EN ESPECIAL A LOS AMIGOS Y MAGOS ESPAÑOLES QUE HAN CONSEGUIDO 8 PREMIOS MUNDIALES. HACIENDO QUE ESPAÑA SEA REFERENTE MUNDIAL DE LA MAGIA. CONSIGUIENDO UNA VEZ MÁS Y DE FORMA CONSECUTIVA INCLUSO EL GRAND PRIX (MÁXIMO GALARDÓN). 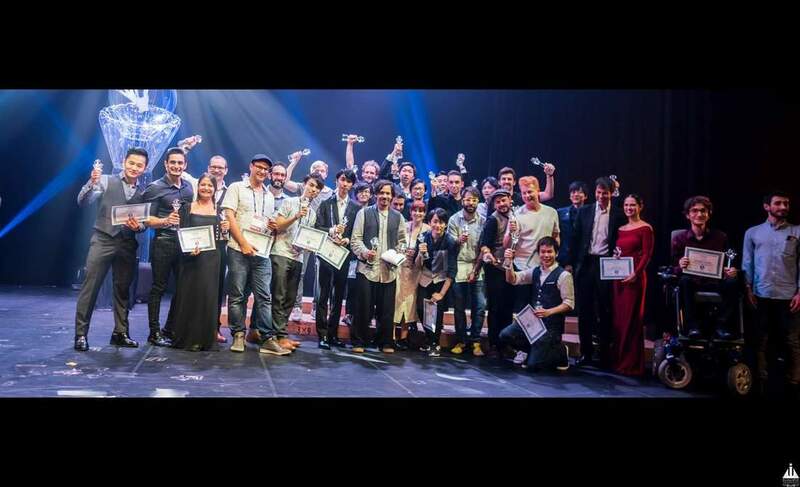 CONGRATULATIONS TO ALL WHO HAVE MADE THE ILLUSIONISM WORLD CONGRESS IN KOREA POSSIBLE. ESPECIALLY TO ALL OUR FRIENDS AND SPANISH ILLUSIONISTS WHO WERE AWARDED EIGHT WORLD PRIZES, THEREBY BRINGING PRESTIGE TO SPAIN. FURTHERMORE, ALSO WINNING FOR ANOTHER CONSECUTIVE YEAR THE GRAND PRIX. ​QUEREMOS AGRADECER LA CONFIANZA DEPOSITADA PARA PODER REALIZAR UN NUEVO PROYECTO DE MAGIA CON ALGUNOS DE LOS MEJORES MAGOS DEL MUNDO. ​WE ARE VERY GRATEFUL FOR THE CONFIDENCE GIVEN IN OUR ABILITY TO LAUNCH A NEW ILLUSIONISM PROJECT WITH SOME OF THE BEST MAGICIANS IN THE WORLD. 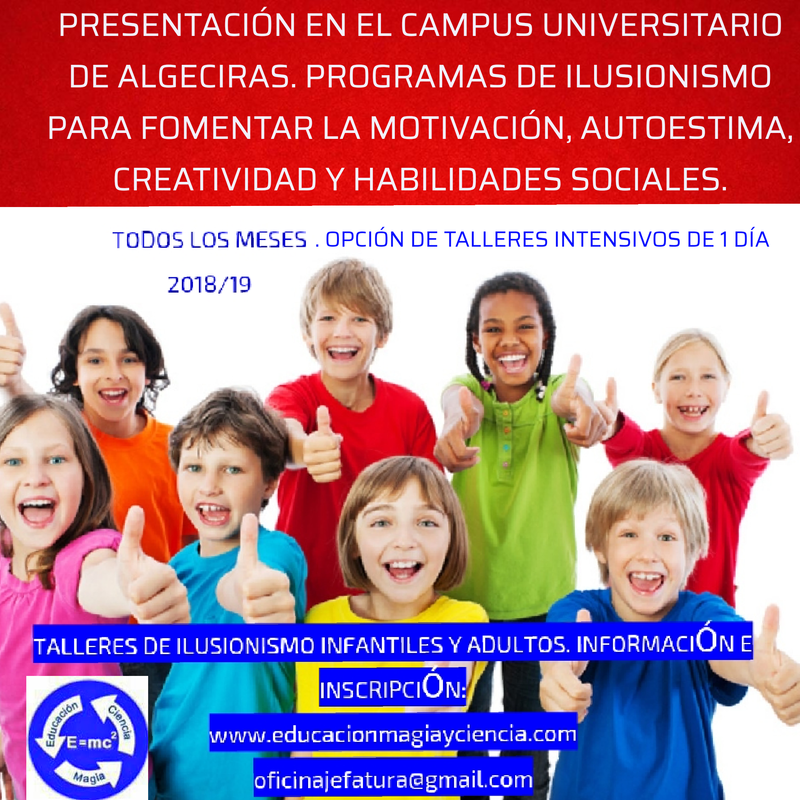 ​TALLERES INTENSIVOS DE UN SÓLO DÍA. EDUCACIÓN PERSONALIZADA.